My review is based on an ARC I got from the publisher via NetGalley in exchange for my honest opinion. Where do I start? This book was a fun, crazy mixture of history, magic, alchemy, science, passion, and mystery. I didn’t really know what I was in for when I started reading it, but I soon found myself sucked into the story, drawn into the web of secrets hidden in the Lobkowicz palace in Prague. My review cannot possibly touch on all the important points but I hope it can provide some more info about what to expect. Honestly, I don’t quite know how to review this book because it wasn’t exactly… normal. And I mean this in a good way! The novel is written in third person, mostly from Sarah Weston’s point of view. Sarah is a talented musicology student but she’s not your typical academic. She’s quite down-to-earth, partly because she’s not exactly from a wealthy background. She knows what she wants and who she wants and she goes after that without being ashamed. Right along with her mentor, she’s obsessed by Beethoven, so of course she jumps at the chance to spend the summer in Prague to help prepare an exhibition of Beethoven manuscripts in a soon-to-open museum. When she gets the news that her mentor, on whose behalf she was called there, has jumped from a window, she is determined to figure out what really happened because she doesn’t really believe in his suicide. As soon as Sarah enters Prague (actually even before), the city is set up as a place of mystery, of blood and secrets. And Prague truly does have violent past – religious controversies, the Thirty Years War, the Nazis, the Communists… take your pick. Also, the city might be threshold to another world. All in all, there are layers upon layers of culture and history. Since I love both of those things and have always been fascinated by alchemy, I really enjoyed this aspect of the novel. Another thing I really liked was the characters. I think there wasn’t a single person I’d consider ‘normal’ in the whole novel – that doesn’t mean I didn’t empathize and identify with them, though! The other academics at the palace were a crazy bunch and made me laugh out loud all the time. I was also constantly evaluating all they said and did to figure out who is on which side. Because are there ever so many sides… everyone at this palace is looking for something, and they are ready to take a lot of risks to get it. So who is Sarah up against? Well, one of the most powerful senators of the US, for one. Charlotte Yates was a villain I loved to hate. Manipulative. Hypocritical. Ruthless when it comes to keeping her secrets. And yet also sentimental. You might say she was a bit overdone, but so were all the characters in a way. One of the great things about this book is that it never takes itself too seriously. I mean it doesn’t treat its subject in an off-handed way, but there’s a humorous kind of self-aware, postmodern-ish irony that permeates pretty much everything and that makes certain parts stand out even more by its sudden absence. Speaking of characters, it’s impossible to overlook Nicolas Pertusato, ‘the dwarf’. He’s a very slippery and elusive character. He shows up everywhere and apparently knows everything. I was very mistrustful of him at the beginning but I grew to like him over the course of the book. Polly, a blind child-prodigy Sarah is in a strange student-teacher relationship with (who takes what role is not quite clear) was another one of my faves. She may not be able to see, but her other senses were superior instead and she was even something of a prophetess in addition to being a pre-teen composer and pianist/violinist. Generally I guess you could also call this a novel about the senses and perception, and about people gifted with an extraordinary amount of that in certain areas. 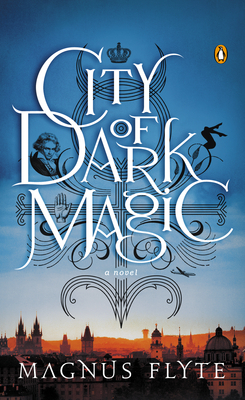 It’s impossible to discuss City of Dark Magic without speaking of music, and of LVB – Ludwig van Beethoven. He's a red thread connecting everything in the novel, and a perfect example of how the authors (yes, Magnus Flyte is the pseudonym for a collaboration) mix the High with the Low, often for comedic effects but also for realism. We see his letters, and through Sarah we glimpse his passion for music, his persistence to compose despite bad hearing and bad health. Through him, we are also introduced to the strange drug mentioned in the book description. I don’t want to go too much into what exactly it does but I was really fascinated by the parts in the book where it appeared! It’s the link between the music part and the alchemy/science/mystery part of the novel, and I don’t know if the word ‘drug’ is really appropriate. It sounds as if it was about a cheap high, but it’s really not. It’s about altering perception. If my review seems a bit rambly and all over the place that is in part because the book is very long (over 400 pages) and because it shifts directions quite a lot. The plot expands, unrelated things end up being related and vice versa. Roles shift. What seemed stable actually isn’t. Details become important. The distance between real and imaginary, past and present, is blurred. Suspicions turn out to be misleading. I wasn’t surprised by all the twists in the plot, but most things I didn’t see coming or had pieced together wrongly. I read this spaced out over a week or so (I was reading something else parallelly and I was busy) so I’m not sure I can talk about pace, but I was never bored and usually found it hard to put my phone (I only have a kindle app) aside. My final verdict? I loved it (it’s among my faves of the year), but I can see that it might not be for everyone. You may dislike the humor/irony, or the big mixture of things all thrown together like this. That isn’t to say the novel is a mess – there was an overall plot arch, in my opinion, and things were resolved in the end. If you dislike history, this might not be for you, even though the novel treats it in a very irreverent kind of way. But if you’re up for something unique and magical without paranormal bits and are ready just go with it, you’re in for one hell of a ride! Have you read City of Dark Magic or is it on your TBR? Is my review even... comprehensible? I really had trouble getting my thoughts about it into words. Does it sound like something you guys might enjoy? Oh awesome - I'm so happy you enjoyed this! Honestly this sounds like something I would love regardless and I've been really wanting to start my copy...reading your review definitely encouraged me further :) Thanks for the great & honest review!! Thank you :) I really liked this one and I hope the authors write another collabo-novel! Doesn't have to be sequel though. So yeah, I think you should give it a shot! I usually read just YA mostly, but this one sounds very promising--I might have to venture out of my comfort zone! :) Thanks for the great review. I think I will read this book.Your review was very helpful.Thank you! Great review.. i wasnt sure about wanting to read this book but your review gave me more reasons to want to!! All that I can say is this.... I Want this book immediately! It sounds absolutely right up my alley and I think we would have a fantastic time together! I loved reading your review, and it cemented that I need to read this story ASAP! And bonus, I am crazy about that cover. Perfect! Thank you so much for your wonderful review! Although, I'm not a History fan, I am curious about the humor and intrigue of this book. Fab. review! a mixture of history, magic, alchemy, science, passion, and mystery---im sold..Im dying to read this book and it sounds awesome--great review!!! !